BEVERLY – The true test of a musical score doesn’t come the first time you hear it, though once is often enough to determine the songs are strong enough to stand on their own and perhaps become standards. No, it comes on the 10th or 15th or 20th time, when it still has the power to move you and capture you. And so when Peter Leigh-Nilson conducting the orchestra for “Peter Pan” at the North Shore Music Theatre launches into the first notes of “Neverland” during the overture, it can bring you all the way back to a time in the mid-50s when Cyril Ritchard was chasing Mary Martin around on your black and white TV in NBC’s broadcast of the Broadway hit. Sometimes we forget the tale of the young boy who won’t grow up can be a rather dark piece at times, with kids walking the plank and ravenous crocodiles. That’s where the comic relief comes in. 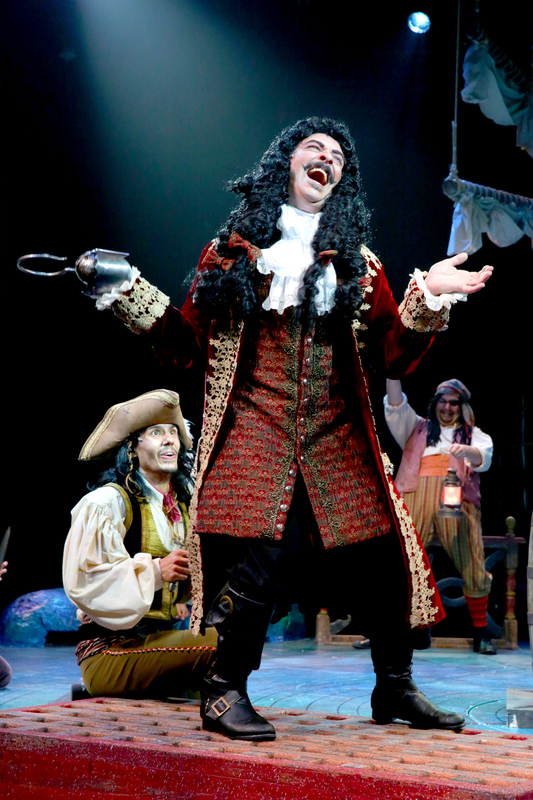 It is always a pleasure to welcome the IRNE Award-winning Beverly native James Beaman – wanted for Grand Theft: Scene in many states – back to local stages, and here he has what he called “a dream role” as Captain Hook, leading a rowdy band of pirates from the Jolly Roger who terrorize the denizens of Neverland, including not only Tiger Lily (a lively Victoria Byrd) and the Neverlanders but Peter Pan and the Lost Boys. When they are not creating mischief, they are breaking out in song and dance, with Beaman’s Hook inexplicably adept at both the tango and tarantella. He’s almost too charming until he starts waving that hook or abusing Smee (Paul Castree), his hapless mate. Elena Ricardo is in the mold of other Pans who have played the role locally such as Sandy Duncan and Cathy Rigby, athletic and strong, but not so big in stature as to lose the suggestion of a young boy who could take flight at any moment; it goes without saying she is a solid singer and dancer. And yes, folks will fly, courtesy of the work of ZFX, Inc.
Portraying animals on stage is never easy, but huge kudos to Ian Shain for wonderfully and energetically performing the roles of Nana, the faithful Newfoundland dog caring for the Darling children,and later the crocodile who endlessly pursues Hook to complete the meal he started years before. Another warm, welcome local presence in Kathy St. George as Mrs. Darling, opposite Beaman playing an exasperated Mr. Darling in a dual role. Kate Fitzgerald is a striking red-headed Wendy Darling, a caring and loving “mother” to Pan’s unwanted role as “father” to the Lost Boys alongside capable brothers Peter (Jake Ryan Flynn, who first developed and continues to develop his talents at NSMT) and Michael (AJ Scott). The Lost Boys are a lively bunch indeed: Liesl Jaye as First Twin, Paige Sabo as Second Twin, Josh Zacker as Slightly, Maya Kazzaz as Tootles, Vinnie Smith as Curly and Jonathan Quigley as Nibs. 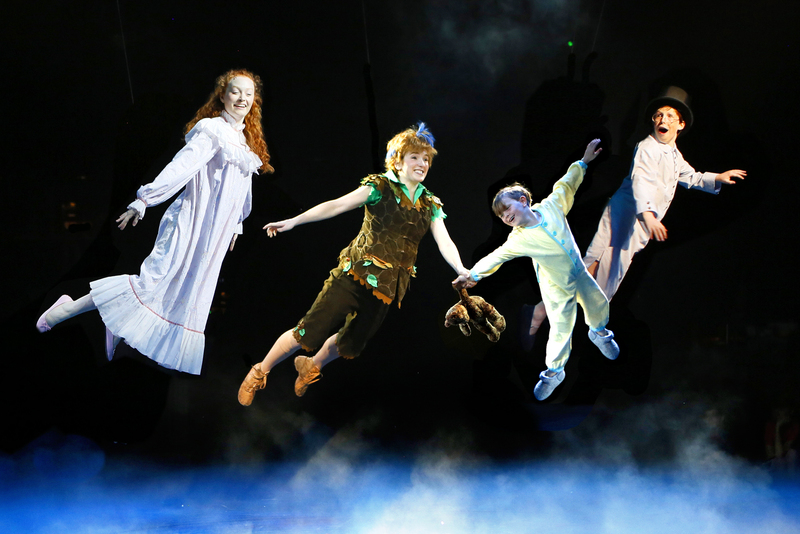 The songs – “Neverland,” “I Won’t Grow Up,” “I’m Flying,” “Wendy” – sound as fresh and vibrant as they did in the NBC television broadcasts of the Broadway show many years ago. The accomplished husband and wife team of director Bob Richard and Diane Laurenson helmed acclaimed NSMT productions of “The Music Man” and “West Side Story” at NSMT and apparently have broken the code when it comes to working in the round. Yes, “Pan” is dated at times, but I’ve long been against judging works written many years ago by 2018 attitudes and mores; the musical is based o n a play that J.M. Barrie wrote at the turn of the 20th Century. 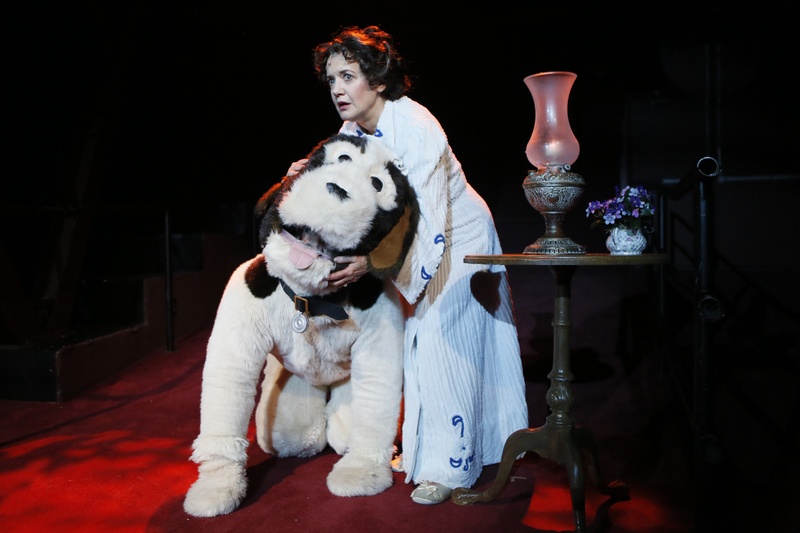 Musicals and plays are a snapshot of a time and place, based on the standards, mores and customs at the time they were written. NSMT, under its former incarnation and now under Bill Hanney, has reserved the July slot as the “family show” and at a recent performance the number of children was heartening. The audience, as always, was assigned an important duty: deciding the fate of the fairy Tinkerbelle, They didn’t let her down. The North Shore Music Theatre production of “Peter Pan.” A musical based on the play by Sir J.M. Barrie. Lyrics by Carolyn Leigh, music by Morris “Moose” Charlap. Additional lyrics by Adolph Green and Betty Comden. Additional music by Jule Styne. Originally directed, choreographed and adapted by Jerome Robbins. Choreography by Diane Laurenson Directed by Bob Richard. At the North Shore Music Theatre through July 22. nsmt.org.